A student committee led by Abigayle Reese ’20 and Haylee Worm ’19 shaped the day with keynote speakers, breakout sessions and a panel discussion that culminated the day. 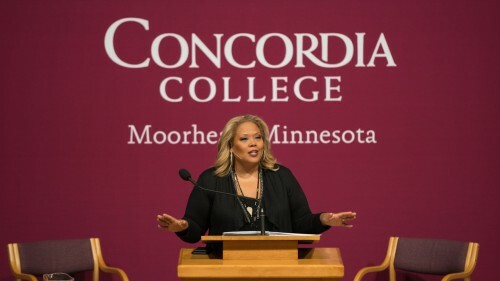 The first keynote, delivered by Tara Setmayer, a political commentator and former GOP communications director, focused on King’s life and legacy while reminding audience members that they too can leave a legacy by leading a life of purpose. “It’s really more about promoting and embracing your purpose and passion in life and following that,” Setmayer says. 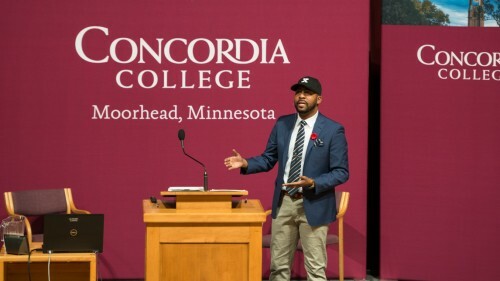 The afternoon keynote by Frank Leon Roberts, a college professor and educator on the Black Lives Matter movement, walked the audience through what the movement is from an insider’s view. He gave 10 points on what Black Lives Matter is instead of pushing back on misconceptions. He noted the movement is also a women’s movement, an LGBTQ movement, and truly a human rights movement because the goal is having each person counted as human and not a commodity for someone else’s gain. The two keynotes were surrounded by concurrent sessions on various topics. One was led by Dr. Edward Valandra, a scholar of Native Studies who has taught at Native and Non-Native colleges. Valandra’s session focused on Settler Colonialism and Settler Fragility. Based on Robin DiAngelo’s understanding of white fragility, he looks at how this concept is deployed as a mechanism to undermine Indigenous Peoples. Valandra, along with Leon Roberts and Setmayer, were joined by Dr. Faith Ngunjiri, the director of the Lorentzsen Center for Faith and Work at Concordia, for a panel discussion to cap the evening. This was the opportunity for audience members to ask questions of the speakers and dive deeper into the topics of the day. Moderated by Mikal Kenfield, director of Residence Life, the panel talked about ways people could preserve and carry on King’s legacy in a way that makes sense to each person.